Platinum blonde, honey blonde, bottle blonde, bleached blonde, natural blonde, sun kissed blonde, and so on and so forth. Blonde is one of the most sought after hair colours in the world, so it's no wonder there are so many descriptives attached to it. This week Art of the Day presents seven blondes. Whether they are natural blondes or not, I do not know. Blonde woman sports fashionable attire with style. Primary colors play back and forth with red and blue. 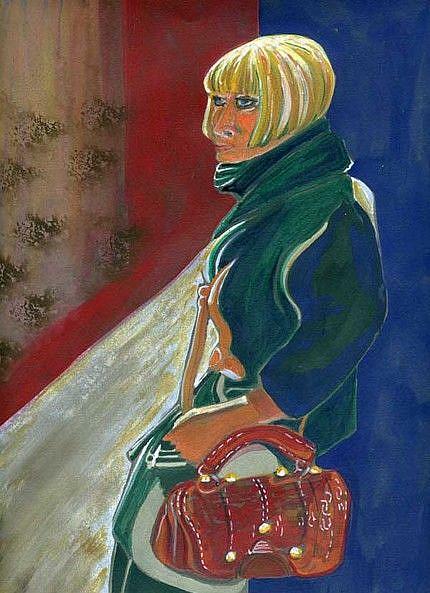 Original painting for your stylish collection.The "Fashion" series focuses on people's body language, facial features and capturing textile patterns and draping with paint..